Once owned by Roy Lichtenstein and later donated to the Solomon R. Guggenheim Museum, Four-foot Flowers is a rare four-color version from the celebrated series of flower paintings that Warhol painted for his first show at the Leo Castelli gallery in November 1964. The flower paintings were derived from a color photograph of hibiscus blossoms that were printed as a two page fold-out in the June 1964 issue of Modern Photography. 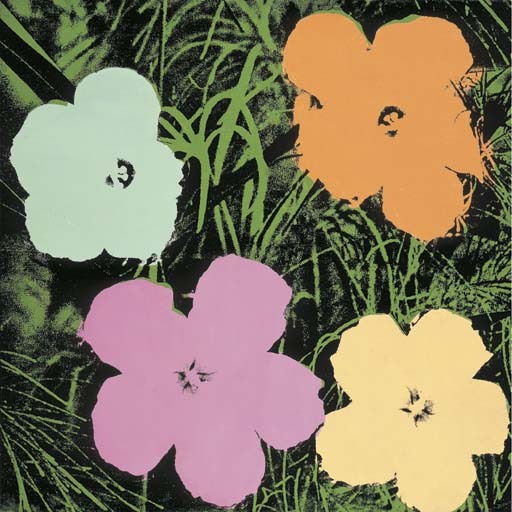 Wrongly identified by homophobic critics as "pansies", Warhol's four hibiscus flower heads have been cropped from the original image and through the repositioning of one of the flowers - by rotating it through 180 degrees - transcribed by Warhol into a square format. The square format of the paintings particularly satisfied Warhol because its regular shape allowed the flower paintings to be hung "any side up." "I like painting on a square", he later said, " because you don't have to decide whether it should be longer-longer or shorter-shorter or longer-shorter: it's just a square. "(cited in D. Bourdon, Warhol, New York, 1989. p. 191). The flat, lurid tones of the four separate colors of this painting were subsequently printed over the background creating the sensation that they are floating above a photographic netherworld of undergrowth. They are "like cut-out gouaches by Matisse set adrift on Monet's lily pond." (cited in Ibid. p. 191). Seeming like new cosmetic shades from an Avon lady's catalogue, the man-made colours of the four flowers of this work deliberately mock the romanticism and sense of pantheist wonder usually associated with paintings of flowers by subordinating their colour and imagery to a simple mechanical process. The manufactured look of Warhol's flowers emphasizes the process by which they have come into being and their ability to be mass-produced. The flower paintings hereby announce Warhol's synthetic vision of the universe. Having moved in his use of imagery from the supermarket to celebrity and its flip-side in disaster, the flower paintings extract the kitsch and the plastic from man's vision of natural beauty and present the mechanical under-side of popular taste. Christie’s generally offers property consigned by others for sale at public auction. From time to time, lots are offered which Christie’s or an affiliate company owns in whole or in part. This is such a lot.